We do not bill hourly for our services in personal injury cases (the only type of case our law firm handles). All of our clients are on a contingency fee retainer. Our clients are not charged an hourly or set fee for our services. Instead, we charge 33% of all cases that we settle before filing a lawsuit and 40% of any money we recover for the client after a lawsuit is filed. If you are a victim and have suffered a loss, you do not want to suffer another loss -- this time a financial loss -- if you do not prevail in your case. Our retainer solves this concern. If you lose your case, our law firm receives no fee, and you do not have to pay any court costs and other expenses incurred in your case. The most significant issue for victims is whether they are responsible for any costs or fees if there is no financial recovery. In Maryland, and in most states, the law allows the lawyers to bear the risk of the costs of the claim if no recovery is made. This should be painfully clear in the contingency fee agreement itself. We bold this language to make sure there is no ambiguity. If you need the lawyer to explain what the agreement says, that is a problem. It should be written so that at 8th grader could understand it. Remember, most lawyers will give you a free consultation before signing an agreement. Ask all of the questions that you need to ask to make sure you are making the right decision. Remember to look and see if your lawyer has a history of results. But do not stop there. Many lawyers list settlements and verdicts in cases that they have referred to other lawyers. (Frankly, lawyers that have referred cases to us have done this.) Ask your lawyer point blank if his or her law firm handled the case in question or did they have help from other lawyers. A red flag of concern should be raised if the law firm is charging you for your property damage or PIP (no fault) claims. There are some cases where injury victims may not need a lawyer. We think this is the exception rather than the rule but there are millions of case so there are a lot of exceptions. Just ask the attorney why he or she believes you should be hiring a lawyer. Make sure the agreement is in writing. The law in Maryland and in most states is that a contingency fee agreement must be in writing. I, Sally Smith, retain and employ Miller & Zois, LLC (M&Z) as my counsel to represent me in my claim against any individual, company or entity for bodily injuries sustained arising out of an incident which occurred on October 18, 2017. M&Z will receive as their fee thirty-three and one-third percent (33-1/3%) of the gross amount received in a pre-trial settlement. 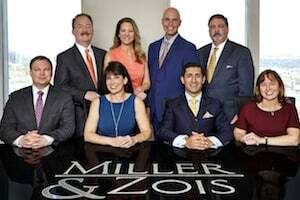 In the event that suit is filed, or my case goes to binding arbitration, Miller & Zois will receive as their fee forty percent (40%) of the gross amount received. M&Z will advance all reasonable expenses associated with my case. Expenses include the collection of medical records, deposition related costs, investigative fees, filing fees, expert witness fees (which is almost always the largest), court reporter and videographer fees, travel expenses and any other expenses M&Z deems necessary for the proper handling of my case. These costs are reimbursed to M&Z out of any financial recovery M&Z obtains on my behalf but only if there is a settlement or judgment. M&Z may assist me in processing my personal injury protection claim, but it does not represent me in this claim and will not take any fee for the help it does provide. M&Z has my power of attorney to complete and sign any application or paper work necessary to process my personal injury protection claim on my behalf. M&Z does not represent me for any property loss claim. We handle tort cases throughout Maryland. We also take severe injury and wrongful death cases outside of Maryland. If you or someone you love has been injured or killed by the negligence of a person or company, call us at 800-553-8082 or get a free Internet consultation. Do I Have to Pay Twice If I Terminate My Lawyer?